The Center for Strategic Leadership (CSL)'s areas of emphasis are experiential education, Senior Leader education, support to Army Senior Leader research, and support to both US Army War College (USAWC) and Army Senior Leader strategic communication efforts. CSL's professional staff and facility host, support, develop, and conduct world-class events (workshops, symposia, conferences, games, and exercises) focused on a broad range of strategic leadership and national security issues and concepts in support of the USAWC, the Army, and the Interagency and Joint Communities. Check out some of the things we've been working on! COL(R) John Bonin, PhD., Professor of Concepts and Doctrine in CSL's Strategic Concepts and Doctrine Division, authored a chapter, "Echelons Above Reality: Armies, Army Groups, and Theater Armies/Army Service Component Commands (ASCCs)", in the recent Army University Press book Essential to Success: Historical Case Studies in the Art of Command at Echelons Above Brigade. COL(R) Bonin's chapter summarizes the history of echelons above corps headquarters in the U.S. Army, and argues for the continued requirement for both theater and field armies as echelons above corps. 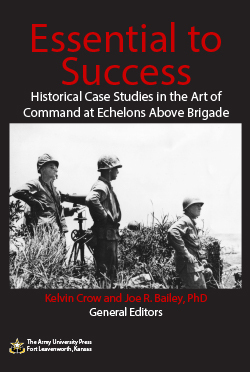 The entire book is available as a .pdf file at http://www.armyupress.army.mil/Books/Browse-Books/Command/Essential-to-Success/ . Interested in using wargaming within the classroom? The United States Army War College will be hosting a panel discussion focusing on innovative ways to introduce wargames into a seminar focused curriculum. From the Director, CSL: "We cordially invite you to attend a panel discussion on "Innovation in the Classroom Involving Wargames", convened by the Department of Strategic Wargaming on 22 July 2017 at 10.00am-11.30am. The panelists are four distinguished educators within the Department of Defense. The location is the Army Heritage Education Center, which is adjacent to Carlisle Barracks, in Carlisle, PA, and does not require a pass or special entrance approval to access. The speakers are Dr. Peter Perla (US Navy War College), Dr. Jim Lacey (US Marine Corps War College), Dr. David Lai (US Army War College), and Dr James Sterrett (US Army Command And General Staff College). The panel will begin at 10.00 AM and go until 11:30 AM. Lunch is available at the Cumberland Cafe (no-host) or bring your own. 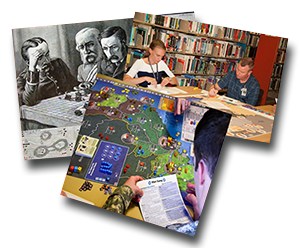 Demonstrations and play-testing of both original and commercial games, currently used in US Army War College classrooms, begins at 1300 and will run until 1600. Hope to see you there! As our news and accomplishments hit their six month milestone, they are moved from this page to our, "News Archives" page. If you're looking for something specific, or if you just want to take a look at the things we've done in the past, please visit our Archives.